Love bowling but don't have time to hit the local lanes? 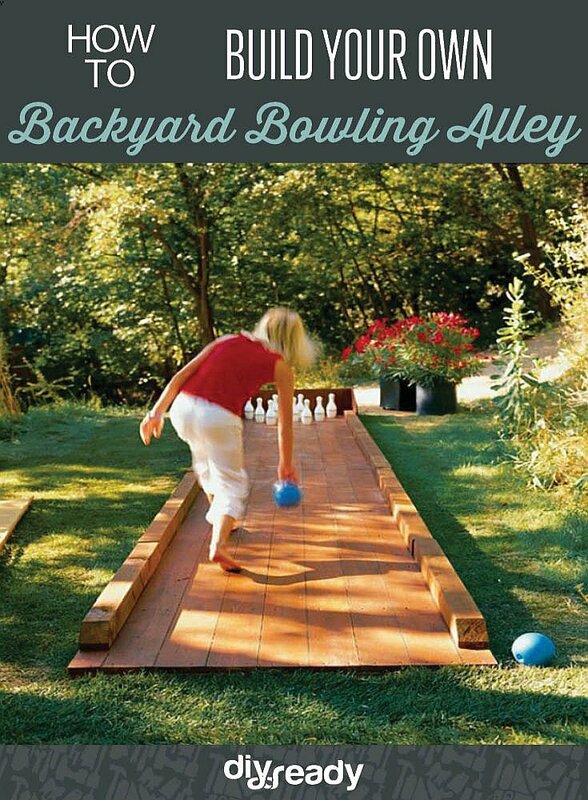 Build your own Backyard Bowling Alley! Some people have their own pool, even tennis court and basketball court on occasion. But bowling alley? Now that's unique! Build a backyard bowling alley and we guarantee you'll be the envy of the neighborhood. It's fun for kids and adults alike, and is a great way to practice your pin-squashing skills without spending money at your local alley. Start with a base made with 2×4 panels and plywood. Make it as long as you want it to be. Who wants to set pins up after every turn? Create a pulley system to pull the pins back up. Drill holes on top of each pin and thread string through them. Just tug on the blue string and the pins get reset. Lay down some boards and level them. Optional: Add lights for cool flair and the option to bowl at night! So awesome, right?! All that's missing is a grill and a bar and you're all set for your next backyard party! Did you enjoy our post on this Backyard Bowling Alley? Let us know in the comments section below!